Who is she, this favorite of the public, who has won fame on two continents, the notorious “Chauntecleer Queen”? One of the stars of not the first magnitude on the horizon of the commercial screen? A beautiful woman who demonstrates her exotic charm in bright outfits against the backdrop of gilded interiors and oleographic landscapes? An actress, whose talent may seem problematic if you confine yourself to the criteria worked out in contacts with high-quality cinematography. 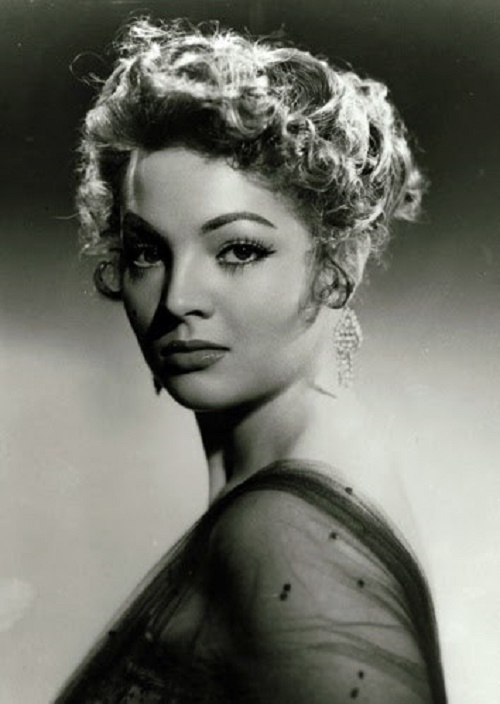 Biographical information about Sara Montiel is contradictory and confusing: serious movies almost never mentioned her, and mass magazines took little care about reliability. The date of birth was 10 March 1929. Place of birth – Spain, Campo de Criptana. Severe poverty of the Spanish village. Gloomy atmosphere of the Catholic family, where the daughter since childhood was prepared for the monastery. Early musicality (aged three she sang folk songs, at seven – learned all parts of three operas by heart). The flight of an eleven-year-old schoolgirl to Madrid for a children’s song contest and a victory in this contest. For the first time she became known as a singer. She studied at the music academy, played in the theater, and sang on the radio. When film director Vicente Kasanova began to look for young talents, she was among the few lucky ones. No wonder, she played in fims since the age of fifteen. “I never had to study my profession anywhere,” – we read in one of Sarita’s interviews. First, her film career lasted seven years: beginning at nineteen, she left the movie at twenty-six. And when Lucia Bose announced her intention to resume film career, the general reaction of the press was bewilderment. Thirteen years given to the family, and how she decided to return to the set after such a break? To start all over again – not a young prize-winner of beauty contests, but on the eve of her forties? Since 1955, Bose has ceased to act. Newspapers that have married “Miss Italy” with the “great torero” Miguel Luis Domingin as a sensation of medium caliber, have since firmly forgotten about the actress. Her name only rarely flashed in the columns of the society chronicle – until, after the divorce, she decided to return to the cinema. The surging wave of a new interest in the former celebrity also brought out some realities, together with the inevitable husk of gossip and speculation in such cases. But a year later the Italian magazine Epoca wrote: “Despite the thirteen-year break, Lucia Bose managed to occupy a leading position in the cinema.” The question that varied criticism in connection with Bose’s new appearance was resolved. She is a professional, an actress, and not just an asterisk, a model entirely dependent on appearance, a passive object for a movie camera. 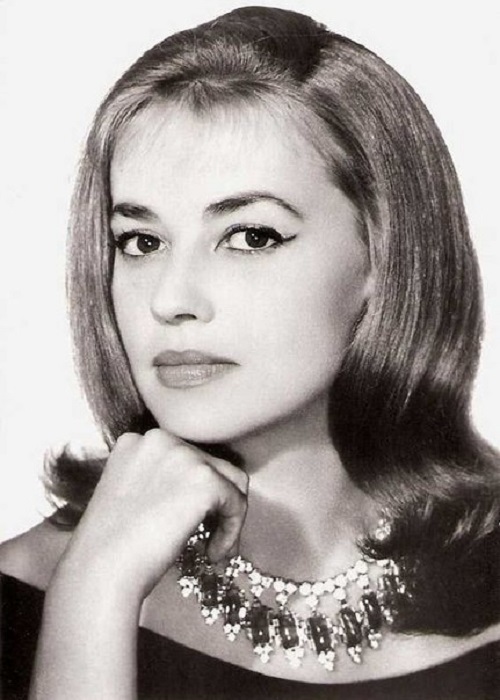 As a star, a woman, and a national figure, Jeanne Moreau exemplified the ideal of the French film actress in the post–New Wave era. According to film critic Ginetta Vincando, “while Brigitte Bardot symbolized sensuality, and Catherine Deneuve – elegance, Jeanne Moreau embodied in the movie the ideal of intellectual femininity.” And Orson Welles called her the best actress of our time. In fact, Moreau asked the audience and critics a riddle. Awarded, honored, and loved, Uncrowned “Queen Moreau” – la reine Moreau, “great Moro” – la grande Moreau, she rose to the heights of popularity. But the secret mystery of Moreau stubbornly escapes from the daring to comprehend it. The roles she played are full-blooded characters given a wealth of feelings, a sharp thought, and whimsical surprises of female psychology. Like all living things, they are obstinate to rational analysis. These roles outlined by a sharp, sometimes paradoxical drawing. In them there is no vagueness and uncertainty. At the name of Moreau, often appears an image of the most mysterious heroine of the screen – Greta Garbo. Perhaps, it will be interesting to look at the magazine “England”, devoted to modern life in the UK, and published by the British government quarterly from 1962 to 1993. Distributed in the Soviet Union in accordance with the terms of the agreement between the governments of Great Britain and the USSR, the magazine was published in Russian. Well illustrated and informative, it was highly popular in the Soviet Union. Traditionally, the magazine published articles on various topics, including politics, economics, science, education, music, art, learning English, cookery, etc. Besides, some pages of the magazine were given to short stories and poetry. In addition, the magazine gave short glimpses on the history of England, traditions and Royal family. Noteworthy, “England” covered the events in the fashion world, the emergence of new synthetic fabrics, trends in the design of clothing and hairstyle. Of course, it’s this section, which attracted me with the opportunity to make a journey into the past, and specifically 50 years back. 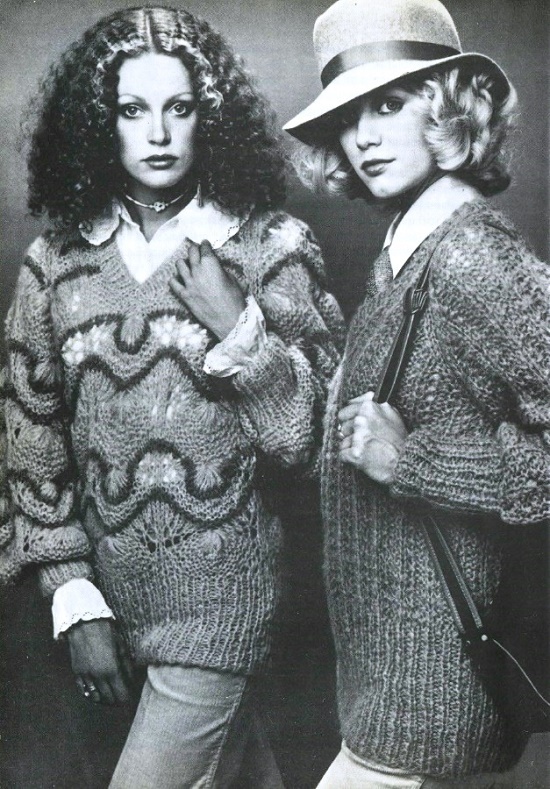 Let’s look at the beautiful models, design solutions, and views on fashion in the late 1960’s – early 1970’s. Born 11 September 1949 in Warsaw, Ewa Szykulska made her debut in cinema in 1966, at the age of 17. 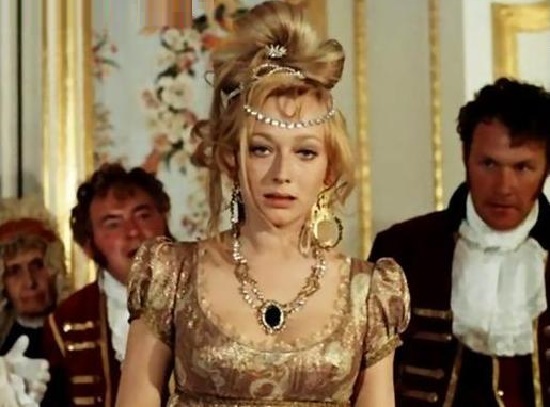 In 1971 she graduated from the State Higher Theatrical School in Warsaw, and in 1973 she made her debut in the theater. She worked in theaters in Warsaw, Wroclaw and Poznan, played in many films. The debut of the 17-year-old actress in the movie was the role in Stanislav Kokezh’s film “Tandem.” A year later, in 1967, the great Polish director Jerzy Hoffmann npticed a young talent and invited to his film “Father”. A few years later, in 1974, their paths once again crossed – Ewa Szykulska played one of the central roles in the famous film “The Flood”, a screen version of the famous novel by Henry Sienkiewicz. Born Johnnie Lucille Collier April 12, 1923, Ann Miller became especially popular in 1940s-1950s, American dancer, singer and actress. Famed for her speed in tap dance and called Tap Dance Queen, she could tap 500 times per minute! Little Johnnie Lucille (real name of the actress) was ill with rickets, so at least somehow to reduce this ailment, the parents gave their daughter to dance classes. Ann fulfilled her childhood dream and played several performances on Broadway. Noteworthy, in the late 1940s, Ann Miller introduced pantyhose into everyday life. Thus, she solved the problem of constantly tearing stockings during the dance performance. Traditionally, stockings were sewn to the underwear of a dancer, and if even one stocking torn, the dancer had to completely change the whole design. That’s why Miller asked for herself to make pantyhose, which could easily be replaced with another pair, if torn. 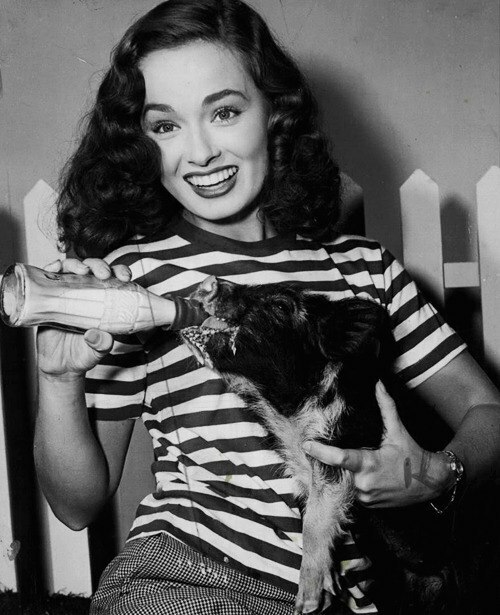 Born 16 February 1928 in a provincial town of New York state, Ann Blyth was the second child in the family of Harry and Nan. Unfortunately, her parents divorced soon after her birth. As a result, the mother with her two daughters had to survive. Besides, this was the peak of the worst economic crisis, known as the Great Depression. Father never provided any assistance to his family and appeared only when Ann had already become a famous actress. Raised by her mother in Catholic traditions, Ann, however, has shown great singing and acting talents since childhood. Noteworthy, 13-year-old Annd debuted on Broadway, and at the age of 15 she became a Hollywood actress! When Ann was 18, her mother died (June 1946). And the peak of her popularity in Hollywood was in the middle of the last century. In fact, nature has endowed Ann in full – she had an attractive appearance, and innate acting talent. And most importantly, she sang beautifully, having a soprano professionally delivered voice. Thus, she had everything to achieve success in the world of show business. The actress successfully starred both in musicals and in films of other genres – dramas, noir, comedy, westerns, adventure and historical.